Whether you’re a casual coffee drinker, have to have a daily hit, or are one pot of coffee away from being able to fly, having the right gear for making your beloved cup of coffee can make a huge difference. Looking for a special gift for your morning routing? Obsessed with cool coffee gadgets? Want a handsome portable brewer to satisfy all of your mobile needs? Or maybe a high-tech tiny espresso maker or a new cup holder for your bike to help boost your caffeine levels? What about a smart coffee mug that connects to the internet? Designed to satisfy your every whimsical (and serious) need as a coffee drinker, these innovative, design-savvy gadgets for coffee lovers and accessories will make your next hit as smooth as half and half. The Kirkland Collapsible coffee dripper is not only functional—it’s uber convenient to carry and perfect for low key coffee snobs on-the-go. It comes in silver or copper (take your pick!) and its stainless steel design packs down, allowing for easy storage. Another perk? It fits just about any generic paper filter. 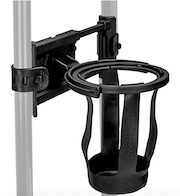 Pimp your wheels with a handlebar mount built specifically for carrying your cup of coffee. We love this option from Portland Design Works, whose slick design and aluminum build will keep you caffeinated for any cross-town commute or extra-long joy ride. 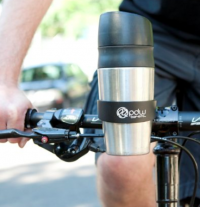 Coffee and bikes go hand in hand, and that’s why this cup holder for your bicycle handlebar made our list of the best coffee gadgets in 2019. Pro tip: Be sure your coffee cup has a lid that prevents leaks—those bumpy roads and quick stop/go’s aren’t ideal conditions to keep your coffee from spilling! You’ve heard of smart cars and smart homes and smart asses, but have you ever heard of smart coffee mugs?! 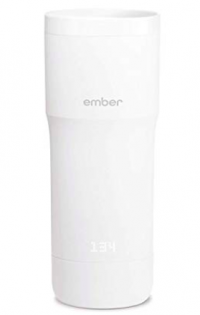 Ember’s temperature control travel mug is one of the coolest coffee gadgets on the market. It keeps your hot beverage the perfect temp from start to finish thanks to its adjustable temperature dial at the bottom of the mug (don’t worry—you can do this through the paired app too!). The battery can last up to two hours, and if you prefer a less travel-friendly version, you’ll love their mug option. 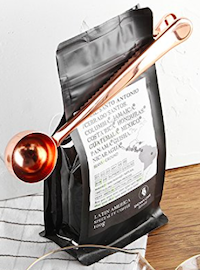 If you came to this little corner of the internet to find coffee making gadgets, here’s a fun one to add to your coffee homebrewing kit: a coffee measuring spoon that doubles as a bag clip to help keep your beans fresh. This one from Hoocoozi caught our eye because of its gorgeous rose-gold color (AKA millennial pink 🤣). It’s simple, utilitarian but appealing, and measures a teaspoon. It’s long stem means you can reach the bottom of the bag. Get a two pack here. Brew, twist, enjoy! Yes, life can be that simple with the Duo Coffee Steeper, a newcomer to the scene for best coffee gadgets. Good for cold brew or a french-press-like pour, this twist and lock coffee brewer utilizes an etched filter that keeps the sludge at bay. The separate chambers mean no mess for you, and you can always customize your brew time to your exact coffee preference—the longer you brew, the stronger the cup. Forget paper filters, too. 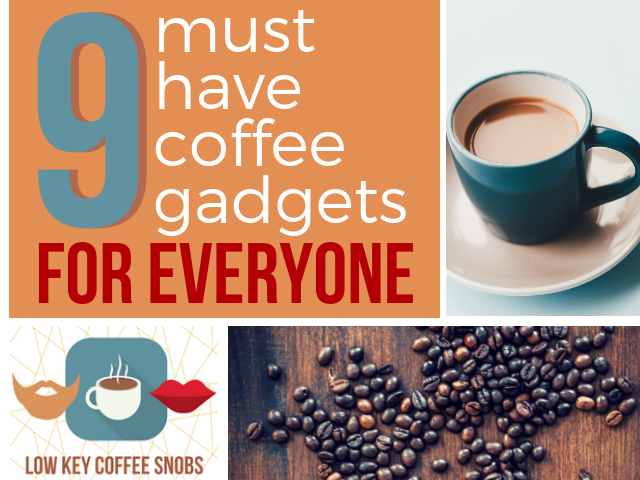 Excuse us while we swoon over gadgets for coffee lovers like these! If finely ground coffee tampered hard is your beverage of choice, then you must add a Nanopresso Portable Espresso Machine to your bag of coffee-making tricks. 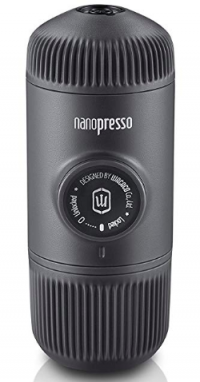 This is perfect for camping, travel, or anyone on the go—especially if you also invest in the Nanopresso NS Adapter Barista Kit to make your espresso-machine compatible with Nespresso capsules. Its patented super-pumping system reaches high levels of pressure during the extraction process (sometimes more than an at-home espresso machine! ), so all you need to do is add boiling water and hit the pump. It’s only six inches long and weighs less than a pound! You can even get a mini version for nearly $30 less. Accessorize with protective sleeves and small storage bags while you’re at it! 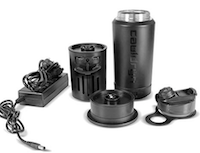 Mug warmers that utilize car chargers have been around for awhile, but one of the coolest coffee gadgets in 2019 is the Cauldryn Fyre Mobile, a battery-powered travel mug that gives you all day temperature control for your coffee. Pick your temp—hot, extra hot, brew, boil, cold—and then enjoy. Ranging from 135 degrees to 212, it has built in USB outlets for a quick charge when you need it. This is the perfect companion for the outdoors, especially since you can use it to boil water and prepare food, too! Once the thermometer hits 50 degrees and above, I’m quick to transition from hot coffee to cold. It’s easier than ever with the HyperChiller (seriously!! takes a minute or less!) and allows you to avoid overly-diluted outcomes from say, simply pouring your hot coffee over ice. 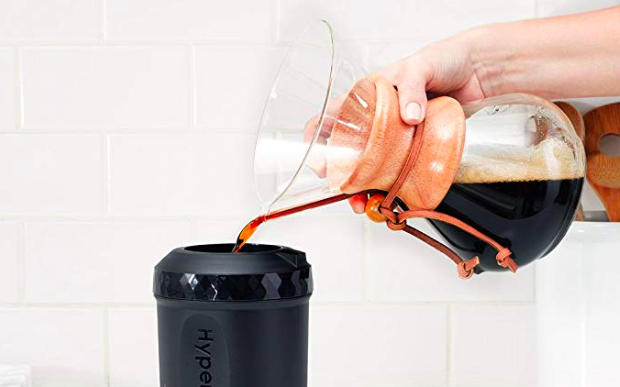 The HyperChiller is a must-have gadget for coffee lovers who *sometimes* prefer their bean juice cold. This coffee gadget mostly cracks us up, but we can’t blame the innovation for whizzing your ESSENTIAL morning cup to catch that early morning flight. Its low-tech but travel ready, as the caddy fits perfectly between standard-sized poles of a rolling suitcase. It claims that it is spill/leak proof, but we’ve gotta see it to believe it! 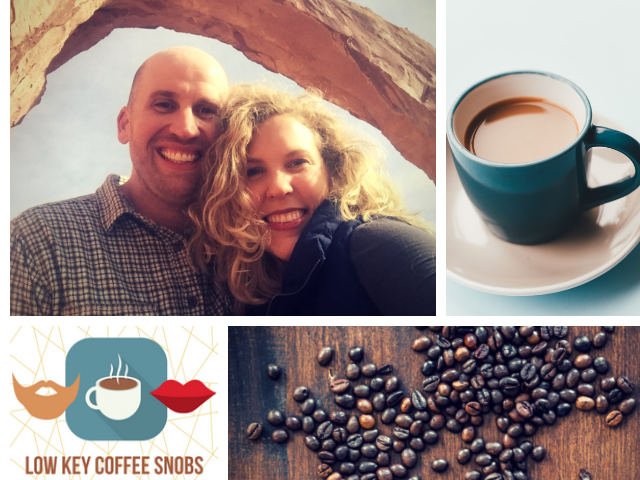 Get your hands on these fun coffee making gadgets! We think these are the coolest coffee gadgets in 2019 for coffee snobs of all shapes and sizes. Innovation and technology is making waves in coffee production, brewing, and storage, and we can’t wait to see what these geniuses think of next. 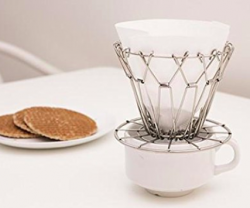 What cool coffee gadgets did we miss? Tell us about ’em!